Today's Sunday Telegraph reports that the Cornerstone Group of Eurosceptic and socially conservative Tory MPs may back David Cameron for party leader. "Cameron has made a big impression on key figures on the Right. He is much more socially Conservative than people think. You should not assume Cameron is instinctively close to people like Portillo. The modernisers think they are telling him what to do, but they are overplaying their hand. We think he will carry forward the agenda of compassionate Conservatism articulated by IDS." The Group has made a significant impact since forming late last year. Edward Leigh has been the Group's most public face but Mr Hayes has been the organising force behind the Group's recent support for Liam Fox. Dr Fox exceeded observers' expectations because of Cornerstone's almost unanimous backing and may only have narrowly missed out on a place in the run-off because of suspected tactical voting by Cameron supporters for David Davis. Mr Davis' angry treatment of the group before the start of the summer and subsequent disparaging remarks about the 'religious right' - since repeated in The Independent. DD's alleged bullying of Eurosceptics during the Major years when Mr Davis was a Europe minister - and his subsequent refusal to match the Fox/Cameron pledge to leave the EPP. David Cameron's enthusiastic support for IDS' social justice agenda - which some think DD has been slow to match. Editor's comment: "The commitment to a compassionate conservatism runs very deep within the group. Michael Portillo has dismissed the Cornerstone agenda as unelectable. When Mr Portillo's view was put to John Hayes on a recent Radio 4 programme he was quick to point out that the new Conservative MP for Enfield Southgate - David Burrowes (pictured) - is a member of Cornerstone. David's compassionate conservatism was more appealing to voters than Mr Portillo's 1997 brand of conservatism. Cornerstone members are easy to caricature but in the last parliament some of its members were leading champions of 'progressive' causes. 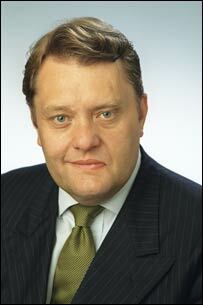 John Hayes, for example, emphasised affordable housing throughout his time as shadow housing minister. Bill Cash is a leading champion of third world debt relief. Angela Watkinson is a passionate advocate for children with special needs." This is good news. Despite the “Tombstone” caricature, Cornerstone have shown themselves to be rather more progressive than the Davisites. While the latter rarely deviate from stereotypical Tory themes, Cornerstone have had things to say about social justice and the environment. Meanwhile, Portillo and other relics from the Portillista era, have shown their true colours by indicating support for first Davis and then Clark, but not Cameron. Perhaps the ‘big beasts’ feel they should stick together, which is what the dinosaurs may have thought shortly before they went extinct. I’m sure there remains a wide gulf between Cornerstone and the Cameroonies, but if these guys can work together for the common good, then that is a hopeful sign. I agree the media seem to find it very easy to caricature the cornerstone group as some kind of UK version of the “moral majority”, but it just isn’t the case. The cornerstone group has always been far broader in its approach than being merely concerned with social issues (important as they are), it was after all IDS who, as leader for all his faults, did more to broaden the conservative party’s approach than anyone else returning the focus to public services again, tackling of poverty and other important issues that had effectively ceded to the Left years ago. It’s then not surprising that Cameron, who would seem to be the kind of articulate and forceful advocate for compassionate conservatism, that IDS and Davis never could be, should be best placed to receive the endorsement of some of those within the cornerstone group who have long championed a broad based, strongly rooted, conservative approach to the full range of issues facing Britain today. Naturally there are differences; Cameron would seem to be far less determined to cut taxation as a necessity, however at the same time he would seem to be far more concerned than his opponent to do more than merely talk about the old core messages on Taxation, Europe and to a lesser extent Crime, and instead broaden the scope of the issues concerning the conservatives, and in that sense there is a great deal of overlap between Cameron and cornerstone “groupers” in terms of approach and policy. …sorry if the post seems rather garbled, its early I have essays to write. I live in Enfield Southgate. I am a Conservative supporter. The reason, to put it simply, that Portillo lost this seat with a 17,000 majority was that he was lazy. He did little canvasing, believing it impossible he would loose his seat. His opponent, Mr. Twigg, camapaigned tirelessly. Mr. Burrowes learnt this lesson. In my view he fought one of the most effective local campaigns I could have envisaged. He did not win the seat through telling everyone he shared Cornerstones views. D&D: Fair comments but David did place a big emphasis in his literature on 'helping vulnerable people'. As former Cabinet member on Enfield Council for voluntary and community services he had a hinterland of concern for disadvantaged people. Owenite Drift is right - Cornerstone's literature is full of social justice emphases. "The commitment to a compassionate conservatism runs very deep within the group..." Does that include gays and single parents, Ed? This again shows the lack of foresight in the Davis campaign. With some simple maneuvering he could have won the backing of Cornerstone without changing any of his policies. But because he continues to make comments about them - such as the ones in the Independent - he risks alienating a large section of his party. Yes Justin - I think it does. I personally hate the 'many not the few' sound-bite. It has overtones of ignoring or worse ill-treating a minority of the population for the sake of the rest. I would think that the essence of Conservatism is that we are not here for the many or the few but for all. Enfield Conservatives have told me that Labour thought that Southgate was safe and focused on saving Enfield North which they did. David Borrowes profited handsomely from this complacency and the fact that smug Twigg was not liked by many voters. Selsdon Man - that was one of the most satisfying moments of election night. Seeing the smirk wiped of Mr. Twigg's face! That was not the vibe I felt. Most people liked Twigg, who had opposed the war, but hated Blair. Many 2001 Labour voters felt that they could not vote Labour again, the Lib Dems were a non-starter so they went back to the party they once staunchly supported. Additionally Labour knew Enfield Southgate was vunerable. In the council elections the year before the wards in West Enfield which had been Labour switched back to Conservative, they were also very rattled by Burrowes strong grass-roots campaign. The Conservative association smelt blood, and managed to produce an 8.9 percent swing to the Conservatives, the largest in any seat in the country. We need to look closely at this example becuase we need swings of 8-9% if we are going to form a majority government in 2009/2010. Interesting. Maybe DC is "much more socially conservative than people think"- and presumably in Cornerstone's judgement more socially conservative than than DD. But it's not clear to me what that actually boils down to. Eg where does DC stand on abortion limits? As for compassionate conservatism, I think both candidates are in favour. It's just that DD has been a lot more explicit about how he would deliver it. While we should never forget the d'Ancona tendency of the Sunday Telegraph during leadership elections towards, ahem, fantasy (remember 'Thatcher backs Portillo' [sic] in 2001), this has the ring of truth to it, up to a point. Hayes' self-indulgent grandstanding, by first touting the absurdist Leigh (with a view to managing his campaign), then being slow to deliver any momentum to Fox, cost 'the Right' a candidate in the final round. It would be quite in keeping if Hayes and Duncan Smith - considered risible liabilities by the vast bulk of their colleagues - now tried pathetically to get in behind the person they fearfully see as the surefire next Leader. You can measure John Hayes by what he said about 'Cameron and his fellow modernisers' at Conference and any opportunistic backing he gives them now. They haven't changed: you have to wonder (not very much) why John Hayes suddenly has. Unless of course he is being the great plotter he so fondly imagines himself to be . . .
"My own view is that we should review the abortion limit in the light of developments in medical science and technology. I would support a modest reduction from 24 weeks." Cameron has been quite open about his views on abortion, in short that he favours reducing the period over which an abortion is permitted by law, with the obvious exceptions for extraordinary circumstances. Agreed the DC website is pretty heavy on policy, more so than DD’s IMO. It's precisely because people have read DC's website that they still think he's policy-lite! All that's there are the soundbites he parrots in response to any question. Why are we still talking about Portillo. The man is finished and is, fortunatly, nothing more than a mere Tv Pundit. I have also been disappointed by the lack of policy content on the Davis site. D&D. Mr Twigg claimed he arrived at the count thinking he was going to hold the seat. We can either deal in direction - which DCs website gives plenty of - or specifics. I am one of those who prefers direction and indication of underlying political beliefs to a regurgitation of dog whistle policies which have lost us three elections in a row. I don't know what Britain will be like in 2009 but to put forward absolutes like a £38bn tax reduction, 30 grammar schools when we don't know if US will go to war with Iran, revolution in Saudi will imperil oil supplies, who the new Russian president will be, effect of droughts in Africa etc. etc looks to me like a losing 4th campaign. Ted, Cameron's site does not give direction. It offers soundbites that could mean almost anything to anyone - as the Institute of Fiscal Studies commented regarding Cameron's tax "pledge". Direction must be clear and consistent. Cameron is neither. Most people liked Twigg, who had opposed the war, but hated Blair. Erm surely Twigg supported the war - he was a Blairite minister. Additionally Labour knew Enfield Southgate was vunerable. It was the toughest Labour nut that cracked on election night - tougher than Enfield North. The local campaigns in both seats also played a big part - from my few visits I could see that Southgate had a good machine going. And anyone who was in the King's College London bar that night will have seen my great expression of joy at that result (I think the only result I cheered more loudly was, bizarrely, South Belfast! ), shouting down the Labour supporters there until we were all made to calm down!